This week, our family Christmas activities center around a word we see a lot at Christmas time: JOY. Then, read the Christmas story again together, and take note, or circle with a red pen every time the word 'JOY' is used. Talk about why it is such great news and why we are filled with such joy at the celebration of Christmas time. Jesus really is JOY for the whole world. Talk about how we can share this joy with others, even if we don't have happy circumstances. Make a list of all the things that bring your family joy at Christmas time. They can be Christmas-specific, or personal to your family. For example: Visiting grandparents, singing Christmas songs, making Christmas food together, swimming in the pool, looking at Christmas lights. Then, with your list, choose one thing that you can include a friend, neighbour or another family in on. How can you share your joy with them? Perhaps you can talk about how to choose joy and share joy with those who don't seem to have much happiness at Christmas time. (Some great projects here: Angel Tree project, Baptist World Aid, Compassion Australia) Talk about how you can choose and share joy because of Jesus, even if Christmas isn't always a happy time. 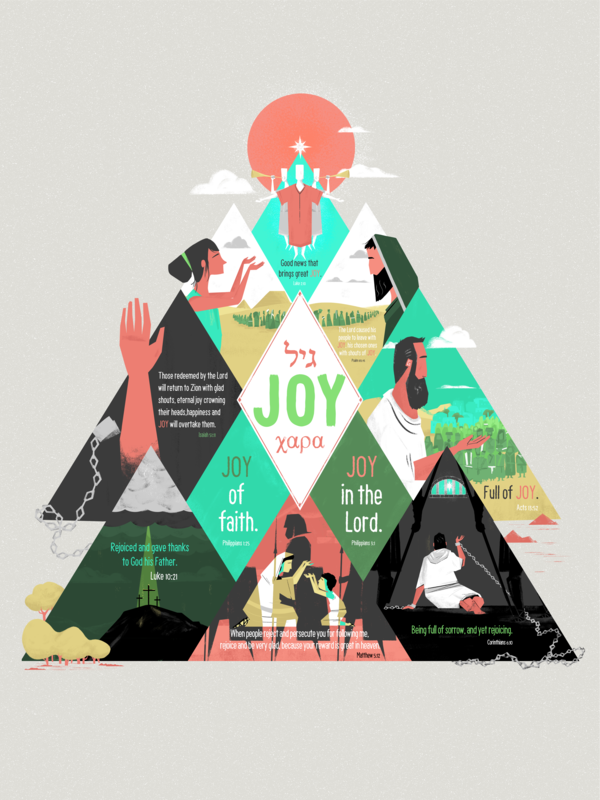 Download the poster on finding and choosing JOY this Christmas, and stick it on the fridge! Make or buy a Christmas stocking for each member of the family. Even a Christmas sock will do! Tie it to the door of each family member's bedroom, over the mantle, or in a place where they will be seen in your home. Then, give each person paper and a pen, and encourage them to write (or draw) as many kind, encouraging things that they love about each other family member, cut them out and stick them in the stockings. Consider finding encouraging Bible verses to include together. Continue to do this over the holiday season as a way to celebrate your family being together. When you read the Christmas story (Luke 2:1-20), talk about how great it is that we can be part of God's big family because Jesus came to rescue us. Choose family or friend(s) that you could take along with you to look at Christmas lights. Make a fun evening out of it, celebrating the journey together. Talk about how Mary and Joseph had to make a long journey to Bethlehem as a family before Jesus was born. Talk together in the car as you drive about your favourite parts about family road trips. Sing favourite Christmas songs and celebrate memories together. Here is a map of Brisbane's Western suburbs best Christmas lights, and a potenial route you can take to see them all as a family. Big Idea: We celebrate at Christmas time because Jesus came down from heaven to be 'God With Us' & save us from sin. This Christmas season we will be suggesting Christmas-related family activities – so keep your eyes on the blog for great ideas on how to celebrate Jesus and love others in your neighbourhood together. Between now and Christmas, hide a nativity figurine of Jesus in the house somewhere. Each day, encourage the kids to try and find where it's hidden. The child that finds it gets to hide it for the next day. Use the moment to talk about how Jesus is the focus of Christmas, and that he came as a baby, into our world, and was "God with us" to resuce us. Find John 3:16 together and talk about how Jesus truly is the best gift of all time. Hit up a grocery store and buy a few boxes of candy canes. When the kids are not looking, go outside (or inside, if weather doesn’t permit) and hide the candy canes in the trees, on bushes, all over the yard. Invite the kids (neighbors too) to find them. Enjoy hot chocolate and re-read the Christmas story (Luke 2:1-20) about the greatest gift ever given.